My good friend and fellow-journalist Dilip D’Souza wrote to me a few days ago with the sad news that a man called Dhanga Baiga, whom we both met a year ago, died last Monday. 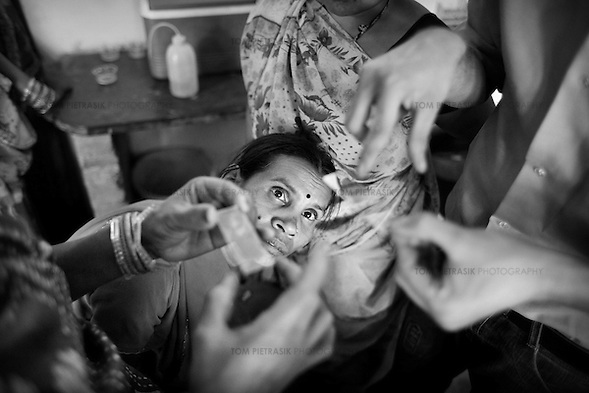 I was introduced to Dhanga while photographing the work of a group of doctors called the JSS who run a hospital in the small, dusty town of Ganiyari in Chhattisgarh, central India. The JSS stands for Jan Swasthya Sahyog which means People’s Health Support Group. It was while photographing Dr Yogesh Jain as he ran an outreach clinic in the village of Bamhni that the wizened figure of Dhanga Baiga entered the consultation room. Moving with a caution that was in keeping with his fragile state, Dhanga, a member of India’s indigenous Baiga community, eased himself onto a plastic stool in front of Yogesh. It was clear that Dhanga knew and trusted Yogesh. Indeed, he owed his life to the intervention of the JSS medical team who had temporarily slowed the advancing tuberculosis that was gripping his hunger-ravaged body. As Dhanga recounted his most recent ailments, Yogesh examined him, gently prodding and squeezing in a manner intended to reassure his patient as much as facilitate a diagnosis. Weighing just 29 kilos, Dhanga was certainly not doing very well and Yogesh concluded by asking him stay overnight for observation before venturing home on foot the next day. 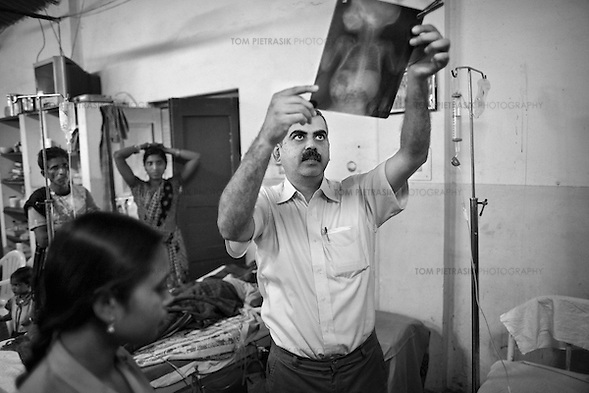 The tuberculoses that had all but destroyed one of Dhanga’s lungs had undoubtedly reduced his chances of survival. 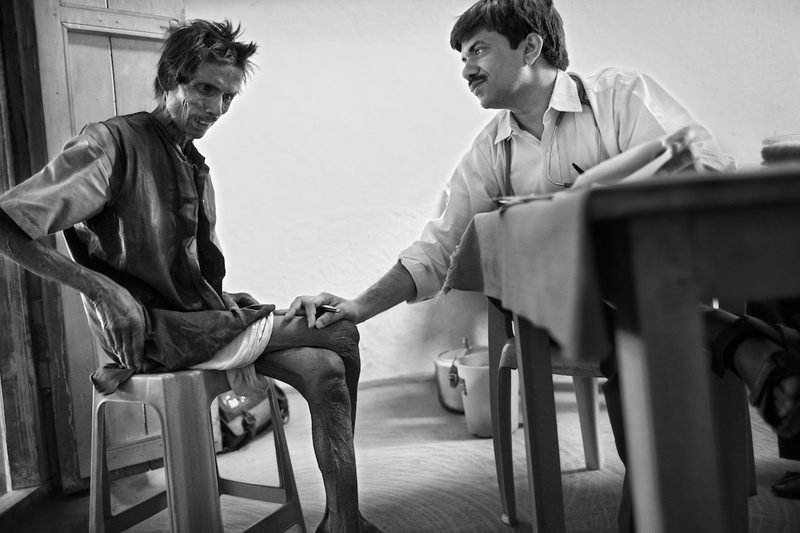 But when I enquired, Yogesh had been reasonably optimistic about the sick man’s prognosis so long as he could raise his calorie intake and avoid the kind of opportunistic infection that so frequently claims the lives of those weakened by hunger. By the time he died, Dhanga had been able to increase his weight by only two kilos. And, as Yogesh had feared, a fever did eventually strike, confining Dhanga to his bed and leaving him unable to eat. Dhanga died last Monday evening, too late for the intervention of JSS field staff who were informed the following day. 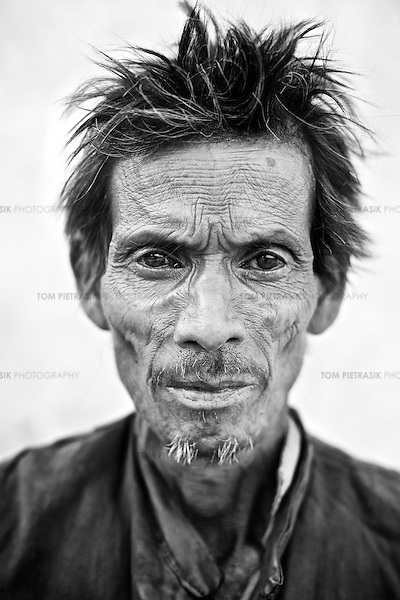 Though no one knew his exact age, Dhanga was probably in his early 50s. Dhanga’s is not an isolated case. Thirty-three percent of Indians are underweight with a BMI (Body Mass Index) below 18.5 which, Dr Binayak Sen says amounts to a “genocide without bullets”. Sen, a public-health activist and advisor to the JSS, currently resides in prison, serving a life sentence on false charges of sedition. Sen’s real crime has been to expose the Chhattisgarh state government’s appalling failure to represent the interests of those to whom it was elected to serve: ordinary people like Dhanga Baiga. 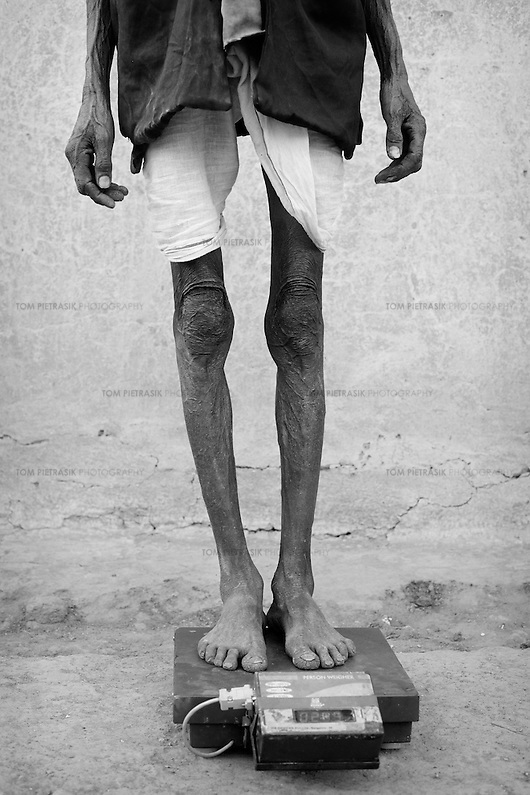 Continually exposed to illnesses associated with malnutrition and poverty including tuberculosis and rheumatic heart disease, Yogesh Jain, Binayak Sen and others at the JSS argue that any serious challenge to hunger necessitates that we also confront India’s vast and growing inequities. I was privileged to spend some more time with Yogesh and his colleagues last month while on assignment for Oxfam and will return to them again here in my blog. In the meantime, a gallery of my photographs of the JSS working with the people of rural Chhattisgarh, including the unfortunate Dhanga Baiga, can be seen here. And, for a revealing insight into the experiences of working as a doctor in rural north India, I’d certainly recommend the Fieldnotes blog written by the JSS’s, Dr Ramani Atkuri. For the mining industry,people like Mr. Baiga happen to be one too many and are taking too long to be rid of. While the family grieves, the industrialists are interested in hastening up the process. Hence, Salwa Judum, encounters etc. History of the Spanish colonisation process went through a very similar process. Shining India is a democratic country, let no one even think otherwise. It truly is…only with a slight twist. It is of the powerful, for the powerful and finally by the powerful. Get it? People and poverty are just incidental, which the garbage cleaners will one day collect. Is that cynical enough? Now for the positives. I know Dr. Jain and the team of brave doctors personally. I wish I could join them but having no qualification, I would simply be an interference, so I did not even dare to mingle amongst those stars that simply twinkle in the darkness of the night. The photographs are simply brilliant. In fact all those photographs should be posters as constant reminders of what our greed has led us to. Now will you please teach me to take photographs of moments of utter despair and yet capture the infinite love and dedication as seen on the faces of the two doctors? Will you, please? It sounds like you’re well informed about India’s mining industry Dipankar. But if you’re interested in reading more, please check out an excellent article by Jason Miklian and Scott Carney that appeared in Foreign Policy magazine last year. I’ve also written about the subject here. I’m afraid I don’t teach photography but I think engaging yourself with the world – as you clearly do – is certainly a good start. Thanks for writing in! It’s a fact that there is such hue and cry over swine flu in india when we cannot prevent TB deaths. an adult weighs 28 kg clearly indicates how malnourished is our population . the RBI governor had recently pointed out that indian population has increased their protein and cereal uptake so the prices are rising . hope the first part of the statement turns true atleast in the next 20 yrs. Thank you for your very sad photo. It reminds of when I first visited Calcutta in 1966 and was shocked to see many people in a similar situation as Dhanga Baiga. I suppose what I now find shocking is that nothing much has changed for many in spite of India’s new found wealth, which now highlights the disparity between the rich and poor. Unfortunately, this appears to be the way of the world. I draw your attention to an article by Joseph Stieglitz in Vanity Fair in which he describes the trend of increasing disparity in the USA. And while there are obvious relative differences in the poor of India and the USA, the attitudes of the super rich towards the fate of the poor are the same. I hope in someway your photographs help to reverse this disturbing trend. Thanks John. I’m pleased that Stiglitz addresses the myth that “a rising tide lifts all boats”. When applied to India, these notions of wealth trickling down not only belie reality but also help to justify complacency among those who’d rather look the other way and ignore the fate of people like Dhanga Baiga. Dr.Binayak Sen’s case is a travesty of the highest order. As long as injustices such as the mistreatment of Dhanga and those who stand up for them, such as Binayak Sen, continues in India, our country will remain in this vortex of suffering, hurtling evermore toward disaster. Bail for Binayak Sen today Apr 15! Yes Dilip, wonderful news! Lets hope the granting of bail inspires the Central Government to fully investigate the circumstances of Binayak Sen’s unlawful imprisonment by the Chhattisgarh administration and hold those responsible to account.